Up your bathroom decor game with a toothbrush holder made fully by hand. It's time to let go of the plastic cup you've been keeping your toothbrush in all these years. 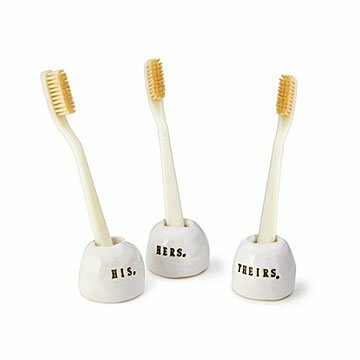 Gitti Lindner has something much cuter on deck: a handmade clay holder stamped with the pronoun of your choice, whether that's "his," "hers," or "theirs." Finished with a bright white glaze, it's just the right size for a standard brush (or a small electric one, if that's your thing). Bonus: Each holder is sold individually, so you can mix and match them to suit any type of couple. Handmade in California. This is great for keeping HIS toothbrush and MY toothbrush separate! Who doesn't need a toothbrush holder?